A week or so ago, the SportsLifer went back to the future. This past weekend the future appeared, in the person of Iona Prep junior running back Jeffrey Mack. 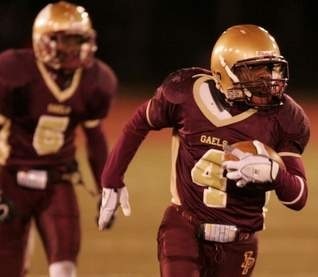 Mack scored seven touchdowns as Iona beat St. Anthony’s, 48-35, in the New York CHSFL AAA finals. Mack scored on runs of 50, 17, 11, 48, 71, 19 and 38 yards. And he added a two-point conversion for 44 points. He also caught two passes, giving him 400 all-purpose yards. The championship was Iona’s first since 1967, and ended a string of seven straight league titles for St. Anthony’s. The Gaels finished the season unbeaten at 11-0 and ranked number one in the New York metropolitan area. Mack, who stands 5’8″ and weighs 155 pounds, came into the game leading the CHSFL in rushing with 1,574 yards and 17 touchdowns. And then he had the game of his life. Mack’s heroics overshadowed those of Ernie Nevers, Dub Jones and Gale Sayers, who share the NFL record with six touchdowns in a game. Nevers also holds the record of 40 points in a game (six rushing touchdowns and four PATs) set with the Chicago Cardinals in a November 28, 1929, contest against the Chicago Bears. No More Turkey Bowl: One of the great traditions of Thanksgiving Day, the Iona-New Rochelle game, is now history. For years, the two arch-rivals battled every year on Thanksgiving morning, but the high school playoff system put an end to the game several years back. Even if they can no longer play on Turkey Day, Iona and New Rochelle owe it to their students, alums and fans to continue the tradition and play each year. Why not make Iona-NRHS the opening game of the football season? No playoff conflicts there. This is worth a click. Junior tight end Philip Lutzenkirchen of the Lassiter High School Trojans (Marietta, GA) tips the ball to a teammate for a touchdown. Seen this play on the basketball court, but never on the gridiron. My connection — one of my nieces is a senior at Lassiter.